This was our second stay at Le Sapin, which is like a home from home. The gite is in a peaceful rural location but close to some lovely towns and good supermarkets. It is spacious and well equipped. The owners, Andrew and Ruth, are always on hand for help and advice on what to do and where to go, and join in with the evening soirees with the guests of the other attached gites. The pool and grounds are ideal for children with swings, trampoline and space for them to play in safety. This is the second time we have stayed in this gite. 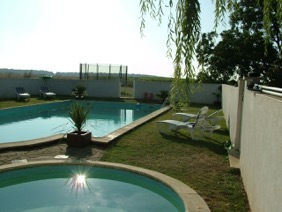 It is great value for a gite with a very large garden and pool. The gite is spacious enough for 6 people, and the kitchen has been updated very tastefully. Our children love the space outside also. It is close to a Hyper U in Chantonnay and various restaurants. It is only a 35 minute drive to Puy de Fou which is probably one of the most amazing things anyone could wish to see in their lifetime. The gite is surrounded by sunflowers and fields and is great for cycling particularly. 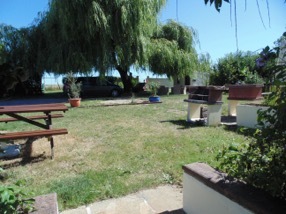 We would highly recommend this gite to anyone who wants a good value stay in France. Andy and Ruth are very helpful and are always around to help when needed. We had the best holiday here. We stayed in the smaller gite, which sleeps 4. It was comfortable & well equipped. The grounds make this place special. The pool is fantastic & my children loved the trampoline, play park & basketball, with loads of room for running around. The hosts were really helpful, giving us recommendations for places to eat. The gites are near a small pretty village with a lovely market & a bread van came most mornings with gorgeous bread & pastries. I have already recommended this gite to friends & family & will definitely be coming back! spent a very enjoyable week here. The gite (Le Sapin) was homely and well appointed. The onsite owners Andrew and Ruth were helpful, attentive and very friendly. 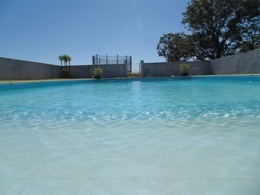 Really pretty, well equipped gite with an excellent Swimming pool and grounds. Ruth and Andrew have a gift for being hosts. First this is evident in the little extras within the gites where they have really thought about what people want (Wifi was brilliant) and about creating a beautiful décor. Second, it is apparent by the way that they look after you during your stay (or leave you to your own devices if that's your preference). It is lovely to stay with hosts who clearly enjoy looking after their guests. Many thanks. Another bonus is the way that the three gites together allow you to be sociable with other families - they would also be fantastic for a group of say three families. We were greeted by hosts on our arrival who showed us the gite and left a welcoming gift of wine and brioche which were greatfully received. Hosts gave us advice on what to see and how to get there including printing off discount tickets for us. Property was lovely, lounge and kitchen spacious, benches and parasol outside. Pool was good size with gradient depth. Also small toddler pool. Pools enclosed with locked gate for child safety. Sun loungers and parasols around pool area. Supermarket 10 minutes away in both directions. Evening trip to La Rochelle was highlight of the holiday-harbour area lit up with coloured lights and carnival atmosphere with street entertainment and market stalls but no-one was pressurising you to buy. Stayed there with husband and 2 young children, and the gites was ideal. Good facilities, including the washing machine, super pool and plenty for the children to do on site. Ruth and Andy made us incredibly welcome, were a font of local knowledge, and their children were great. Super holiday, and I could not recommend highly enough. Fantastic place with lovely facilities & great swimming pool. Superb time, very friendly & great accommodation in a super area. Thanks very much, hope to come back! We all had a great time - what a fantastic location! Kids spent hours in the pool & playing with the kids from the other gites. Andy & Ruth really helpful and keen to share local knowledge. Recommend Les Conches, Le Grand Parc & Mervent Forest. We would come back, thank you. A super week with our friendly hosts on our first holiday in the Vendee. Weather glorious at times, not so good at others. The boys enjoyed the pool whatever and found some good cycling. Thanks we had a great time. The gite was good and Ruth & Andrew were very helpful if you need anything. The pool was brilliant, and really made the holiday. Loved the area - lots to do. Liked Maillezais where you can hire a boat and walk around Abbey. Also liked beaches, especially Faute Sur Mer. Had a fantastic stay. Excellent garden for the 2 kids aged 3 & 5. The pool was wonderful and there was lots got do locally. Nothing was too much trouble for Ruth & Andrew, thanks for a lovely week. Very relaxing holiday; Alexandra (8 years old) enjoyed the pool. Puy du Fou well worth visiting. Thanks for a lovely fortnight. We have had the most wonderful time relaxing by the pool. Such a quiet, peaceful part of France. Gite has been first class. Many thanks to Andy, Ruth, Denham & Fern (Not forgetting George the dog). A holiday we will never forget!! Thank you for a wonderful stay. A great location, ideal for families. Lilly enjoyed visiting all of the gites, including Andy & Ruth’s house and Michelle & Nadine’s ‘La Maison’. Excellent food at the St George. What fun we have had. We enjoyed the St George restaurant (quite expensive – but worth it!) Hope the next gang enjoy it as much as we did. Great base for exploring the Vendée, especially with 3 children and a lot of interesting sites right on the doorstep of La Guillemandière. Limitless walking, running, cycling options, through a usually undisturbed farming landscape. The local villages (St Juire, St Martin Lars etc) and are full of interest and beauty if you can park the car and take time to walk & enjoy it all. Puy du Fou (near les Herbiers at 50 away) is a world class venue. Make sure to see the Ballet of the Phantom birds which is a rare and phenomenal spectacle. The Cinéscene (late show) is well worth the effort. Bring a flask of coffee & a bite to eat! It’s a long evening, but it is exceptional. Fontenay (35mins) is full of interesting historical sites, we had a great al fresco lunch in the centre of town, great value. A 50 minute drive will get you to Maillezais and the ancient cathedral/fortress overlooking the canals of the ‘Green Venice’ It’s worth hiring a boat for an hour at least. Vouvant, Mervant....too many places to see in so short a time. Great pool and garden to relax in while planning the next foray. Many thanks to Ruth & Andy for the warm hospitality and welcome. Je vous remercie! Very nice relaxing holiday. Gites are in a great location for beaches, Les Conches is great and if weather is not sunny rope climbing and Go-Karting etc, in Mervent and Fontenay. Biggest bonus were Ruth & Andy's lovely kids - our two had a great time playing with Denham and Fern! Accueil charmant, calme propriétaires, sympathiques séjour très agréable. Lovely holiday and great gite ! All the kids loved playing in the pool while the adults relaxed ! Andy & Ruth were very friendly and helpful. Must come back again! Thank you for a great holiday. Lovely weather, lovely pool – Used all the time! Puy du Fou – Excellent. Beach – excellent. Accommodation – perfect. Ruth & Andy v.v. helpful & courteous. Thanks. Canals by boat or bike – wonderful! Thanks for a lovely week, enjoyed here and around the area. Pity only a week! Great week – pool excellent, shower good, land groovy, barbecue & all other facilities well provided. Restaurant le St George in St juire was magnifique – fantastic ambience and the food was incredible (we chose the 23 Euro menu). La Rochelle worth a visit – follow your Sat Nav not the road signs! Great Place, great weather & great hosts who couldn't have done more to help. Would recommend Puy do Fou & Green Venice. Oliver & Kyle are going to miss Fern and Denham very much. Great holiday,very relaxing. Warm welcome from Andy,Ruth, Denham and Fern Thanks. La Phare Ouest at St Gemme is well worth a visit for a nice meal/night out. Lovely accommodation and surrounding area. Andy & Ruth very friendly and helpful. We had a great holiday. Thanks very much. Had a great 2 weeks - one of the most relaxing ever! Enjoyed the Gite, the swimming pools and the surrounding countryside with all it's sunflowers! Had a good time at Ile de Re - especially the lighthouse at Les Baleines, and the lovely St Martin de Re where we had an excellent meal at the pizzeria. We also spent a lot of time on the beach at La Faute sur Mer (Plage de Chardons). Andy and Ruth were very friendly and helpful and our kids had a lot of fun playing with Denham and Fern.Thanks for a great time had by all!! P.S. Also recommend Futuroscope for a cloudy day out if you have one! Fantastic holiday. Kids had a tremendous time - the pool is a winner!! If anyone fancies a special grown ups night out then the St. George in the village is outstanding. Thanks very much. Lovely week. Very friendly. Had a great time. Thanks again. A nice relaxing week. Pool was fab. Pity the weather didn't hold out. Children were fun to play with. Excellent, thank you. Lots to see and do despite the unseasonable weather. The Parc de Pierre Brun at Mervent is definitely worth a look if you have children. Very pleasant and welcoming. We have had a beautiful relaxing stay here. Andrew, Ruth and kids are very friendly and helpful. Enjoyed our visit to Le Grand Parc Puy du Fou. Thanks. This has been a wonderful place for us to relax - just what we wanted. Everything in the property and friendly, welcoming hosts. We have toured the Vendee area and enjoyed all the places seen and / or visited. Thankyou. Enjoy your stay!